So I’m in the mood to continue exploring crackpot Snoke theories. Rofl. It’s fun to just go for it! Even if I really deep down don’t think Snoke coming back in IX is possible! @DeeBee wrote: When I saw this I laughed and laughed! I hope it's okay if I share this.. if not mods feel free to delete the images. sorry I don't get the netiquette of it all. I'm anxiously awaiting the next update. It will be: Still Dead! Oh Rofl!!!!! I called it!!! Tweet on April 6th: "He's still dead!" It would be interesting if Snoke's different form was a woman...pretending to be Rey's long lost and apparently not dead mother, luring her in and it would be Kylo to "snuff it out". @Starliteprism – Ohhhh the angst!!! Oh the ick! Please noooo!!!!! but haaaa I like how your mind works starliteprism haaaaa. From Andy Serkis' comments about Snoke and how he seems to fear women or something - this could be interesting.. seeing Snoke take over a female body. Maybe this is how Phasma can return?! Finding video linkage now as came up on facebook feed via Total Film but doesn't have off site link to the video snippet. 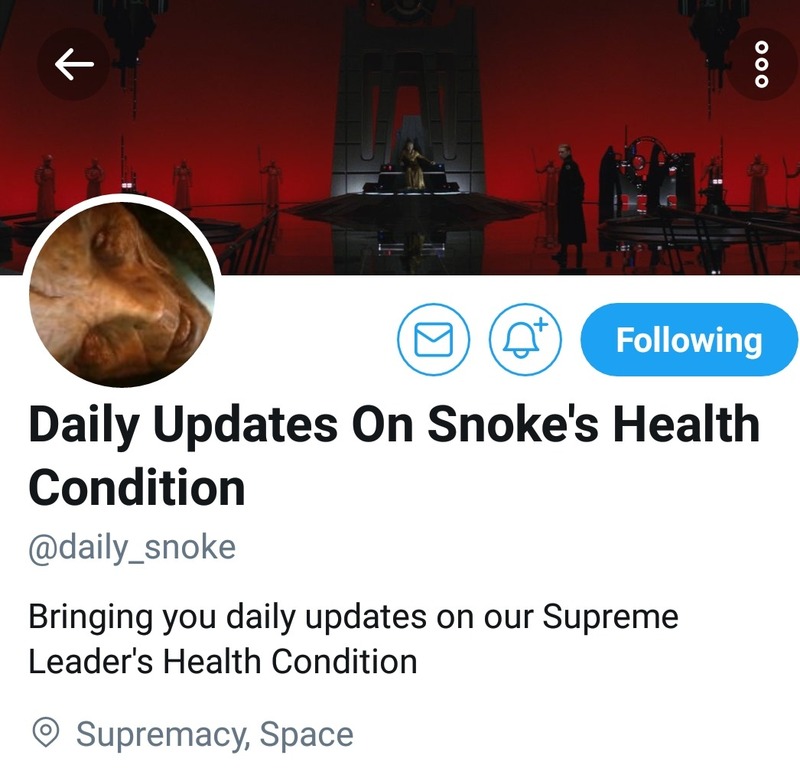 @TheBastardofMandalore – I’d be interested to see more of Snoke! And see Snoke origins.. I am guessing Snoke dabbled with the Jedi order, participated in the Jedi trials – and no one would take him on as a Padawan. Instead he got offered the responsibility of speaking lovingly to a field of beans or something. Nurturing the living force? Ugh. Not for Snoke! So he reacted to this vowing to destroy them!! Muahahahaaa.. I think we will get it, but Andy Serkis isn’t involved and it’s likely comics or books.. but- we’ll see! @Ramblingrose wrote: There is one Snoke Return that I would like. And it involves General Armitage Hux. I wonder if it is possible for Snoke's spirit to possess others than force users? Possessed Hux would be.... interesting! Snoke possess Kylo? NONONO! …. @Ramblingrose – ahhh Rambling Rose I like the way you think! I would love to see possessed Hux. Rofl. Snoke would be cursing having to use the body of a rabid cur! Haaaa! 100% agree - The only two scenarios I would loath to see with Snoke is- 1) Snoke takes over Kylo/Ben's body. 2) Snoke takes over Rey's body. Yuck... and I want these two to have agency! I actually wonder if that would even be possible because of their force bond. Hmm. Curious. @Ramblingrose wrote: …Snoke returning as a force ghost to torment Kylo? Maybe. I would think it is better for the story if it is Luke. His line: "See ya around, kid". He could act as Kylo's conscience. Is it ONLY possible for force ghosts to talk to force users? Snoke could tell Hux who murdered him. But personally, I would prefer surveilance tapes to do that part. I am basically not interested in Snoke anymore. Only if he was returning in the body of an actor we know from the first movies. I think it is to late to introduce a new, big bad force user in IX. @Ramblingrose – If Snoke returned he could torment Kylo. But I suspect if he were to return the connection he had and the access he had to Kylo/Ben’s mind would be severed… I think it would be too hard to move the plot forward if he could read his thoughts and we’ve already done the Kylo/Ben manages to overcome this in TLJ. So the relationship would IMHO be different. I think Hux already suspects Kylo/Ben – he doesn’t need someone to tell him. I also think Hux doesn’t need evidence, he can just fabricate some if he really wants to! He’s a bad guy! @Ramblingrose wrote: … Is it ONLY possible for force ghosts to talk to force users? @Ramblingrose - This is what I am thinking, but I could be wrong! Not even Leia saw the trio of force ghosts at the end of ROTJ. Maybe it is who they choose to see them. I really don’t know. I think canon could make of this whatever they want. @bashfulblueeyes3 wrote: Snoke is very interesting, because he is not a Sith, but a dark side user. According to the novel, he says he has been around a long time and watched the empire with Palpatine rise and fall. It makes me wonder if it might be possible that we might see Snoke in some ghost form, trying to come back, because he is so powerful. This movie is going to be the last so it makes me wonder, what kind of Jedi battle there is to fight left? I don't think that is it will be between Rey and Kylo, but the two of them fighting against something else. As to what, I don't know. @bashfulblueeyes3 - I enjoyed this comment bashfulblueeyes3! It took me a while to get back to it but I got there eventually. LOL. I so agree – Snoke not being a sith, but a dark side user creates a whole range of possibilities. In the Snoke in VIII I’ve been exploring Snoke’s view of the dark and light – and how he didn’t completely reject the light. So it’s possible he could cherry pick a light side user ability and be able to use it. I think we really don’t know. He is so mysterious! @BB-Rey wrote: " There are three ways to defeat your enemy. The first, and most obvious, is to better him in a trial of force. The best way is to have him destroy himself…The middle way is to destroy your enemy from within. Judicious application of the middle way shall make your blows more effective if you later take the way of force. From the middle way it is also possible to push your enemy onto the path of self-destruction." I find this very, very interesting. This comes from the Legends page on Wookieepedia for Atrisia, a planet and in which connects to Snoke's Guards in canon and their history with the empires of this world. I wonder in speculation fashion rather this would at all connect to Snoke being a seeker of arcane and ancient knowledge and in canon knowing Palpatine had a statue that relates to them. So that's another curious connection between them. I find it more curious though for how it relates to TLJ to an extent. Wouldn't having Kylo and Hux divided cause them to fail eventually? Same with destroying the New Republic and cutting off the Resistance from their allies and resources? I really think there's more to Snoke than meets the eye. Same with things we gathered from DJ. Hiya BB-Rey, I have been thinking about Snoke’s knowledge – and what Palpatine knew and passed on to Snoke.. There seems to be loads of connections between the empire and Snoke/ the FO but I'm not really across them.. This is all new to me! Maybe BB-Rey or anyone else can answer this – what do we know about Snoke’s access to the knowledge/archives/artifacts that Palpatine collected? The FO had access to the Imperial archives.. didn't they? but guessing Palpatine had more than that? Anyone read the aftermath series? is there something in that about this? I really want to buy those books! It’s on my list. I’ll get there one day. Lol. But…. what if Palpatine documented this somewhere and Snoke found it. I do wonder if Snoke knew of it or was trying to access it.. and uh oh. maybe he was successful where Palpatine wasn't. Time travel and Snoke could spell trouble. Uh oh!!!! Snoke and Palpatine team up against Rey, Kylo, and force ghosts Anakin, Obi Wan, Luke and Qui-gon. They wouldnt do it, but boy would it be fun to watch. Snoke is a creep de luxe but trolling Reywalkers with "Skywalkah I assumed. Wrongly." is automatic redemption. 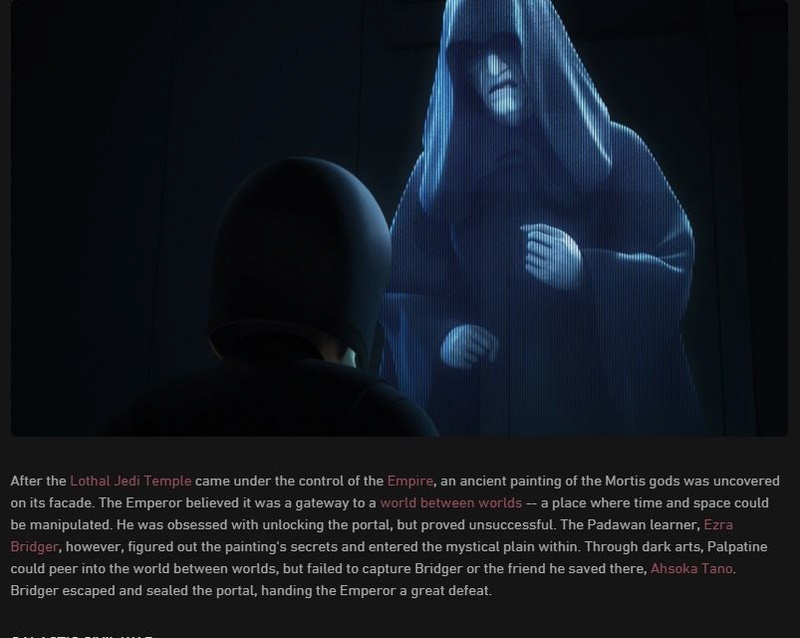 It’s definitely been heavily hinted, in novels, animated series and games (the Aftermath books/Rebels/Battlefront 2), that Palpatine had come across knowledge of these “realms” through his access to the Jedi archives and his quest to find and accumulate Force relics. As for Snoke, I’m thinking his situation is/was opposite Palpatine. The Emperor was looking to access these realms whereas Snoke was looking for a way to get out. What if Snoke was imprisoned in a Force void, like the Mortis gods? Maybe this was how he could watch the rise and fall of the Empire but could not interact. I have a random theory that Ezra Bridger may be responsible for Snoke’s release. He does have the gift for unlocking doorways. After all the last we saw of him he had disappeared into the unknown with a pod of hyperspace traveling space whales. What if he was taken deep into the unknown regions? I could totally see a new series about Ezra’s travels with Thrawn. Think Indiana Jones in space. It’s definitely been heavily hinted, in novels, animated series and games (the Aftermath books/Rebels/Battlefront 2), that Palpatine had come across knowledge of these “realms” through his access to the Jedi archives and his quest to find and accumulate Force relics. As for Snoke, I’m thinking his situation is/was opposite Palpatine. The Emperor was looking to access these realms whereas Snoke was looking for a way to get out. What if Snoke was imprisoned in a Force void, like the Mortis gods? Maybe this was how he could watch the rise and fall of the Empire but could not interact. I have a random theory that Ezra Bridger may be responsible for Snoke’s release. He does have the gift for unlocking doorways. After all the last we saw of him he had dissapeared into the unknown with a pod of hyperspace traveling space whales. What if he was taken deep into the unknown regions? I could totally see a new series about Ezra’s travels with Thrawn. Think Indiana Jones in space. I love it! Lots of hints huh. awesome! I'd love to see Indiana Jones and the temple in space! Thanks for sharing the rebels/aftermath/battlefront 2 insights - I have not accessed this content yet other than very randomly. I think this content is also hinted at in TLJ novelisation..
Snoke being trapped somewhere for eons and then being released - that sounds totally plausible to me! I like it! Maybe Snoke being released was part of Palpatine's contingency plan post empire defeat? Do you think this is possible? I think this passage leaves things very open. It tells us Snoke came along at the right time in the right place with the right knowledge to stop the complete destruction of the empire's remnants and to ensure the rebirth of it as the FO. Hmm that does sound to me like exactly what Palpatine would have been hoping to achieve with his contingency!! Maybe Snoke was Palpatine's secret instrument. From what I've seen, the earliest detailed instance of Snoke acting in the galaxy so far is his influencing Ben Solo from in the womb - is this right? It's interesting, because Ben's conception was very soon after the death of Palpatine... Maybe with Palpatine's death, Snoke was set free somehow? Is it possible Palpatine was Snoke's instrument- and Snoke sat back and let events unfold till the galaxy was ready for him to rise to power? Hmm I think I like that... haaaa... Snoke certainly loves to manipulate others in a rather convoluted, Machiavellian, twisted way to achieve his own ends. And he is a bold risk taker... But Snoke's thinking in the above passage is that the 'evolution of the first order had been more improvisation than master plan.' soooo hmm maybe Palpatine was the planner, and Snoke was the improvisor?! Palpatine as Snoke's instrument does seem less likely I guess.. thoughts? I wonder if any of this will be relevant to IX. Still even if it's not, it's super interesting! I've always had in the back of my mind that to defeat Snoke and truly kill him - Rey and Ben need to come together to bring balance to the galaxy as a whole.. it would certainly be epic! "Is it possible Palpatine was Snoke's instrument- and Snoke sat back and let events unfold till the galaxy was ready for him to rise to power? Hmm I think I like that... haaaa... Snoke certainly loves to manipulate others in a rather convoluted, Machiavellian, twisted way to achieve his own ends." I'm wondering, since Snoke had latched onto and manipulated Ben Solo (since the womb), if Snoke's hold goes deeper. Perhaps even attaching a part of his soul onto Ben. What if episode 9 will be Kylo/Ben's descent into pure madness as he fights for control? I can see Ben sacrificing himself in a final act of redemption to destroy Snoke once and for all and in turn saving the galaxy. Snoke trapped and then seizing the opportunity works for me! I hope we don't have to wait too many years to hear this story! Whoa. Interesting idea! I hope Snoke doesn't have a hold on Ben anymore if he is surviving in some way at the end of TLJ (and I'm not certain he is just playing with the idea) - for me, the weight of the past is enough for Kylo/Ben to deal with..
Snoke - Mr Cut in half..
hiya, not sure how long I have to spoilerise Solo content.. but best I err on the side of caution. Not saying this is what I'm hoping for.... but I'm open to anything! Guys he’s not going to be in IX, he may turn up in books or comics but his role in the ST is over per Rian Johnson. This is like Damerey speculation pure crack that likely belongs in Takodana Woods. @snufkin wrote: Guys he’s not going to be in IX, he may turn up in books or comics but his role in the ST is over per Rian Johnson. This is like Damerey speculation pure crack that likely belongs in Takodana Woods. LOL. You are probably right snufkin, but like I said I'm open to having fun and exploring anything and at this point it is possible. Unlikely but possible. If people want to play around with Damerey, I say good luck to them and enjoy. I could see Snoke in a flashback or two, revealing more of Ben's past as the Luke in the tent with lightsaber flashbacks did. It might be helpful, actually. I can see him coming back, in some form or another. I don’t think he’ll be brought back in the way Maul was though. Perhaps in spirit form. Whether or not he appears in IX remains to be seen. Flashbacks do make sense like @californiagirl said. However, he is too important of a character to just be rehashed in books or comics. His backstory is a big part of Ben’s and the FO. Also, Snoke is ancient and has a grand plan that he has been plotting for a very long time. Ben Solo seemed to be part of his endgame of sorts. I don’t think a little thing like losing his caporal form get will get in his way. Maybe Snoke’s story will pick up again in a future spinoff film or in the new live action or animated TV series (Resistence). If Snoke does come back, I definitely think that ring will have something to do with it. @californiagirl - yeah if I heard Andy Serkis was cast for IX I'd be guessing it's a flashback or two.. but I'd be really open to Snoke's return in another way. I am guessing we won't see the full story of what Snoke got up to with the skywalkers -but I do hope that in the movies we at least get a sense of how Leia, Han, Luke and Kylo/Ben were all targeted from very early on - I think it will help Kylo/Ben forgive for him to accept that they made mistakes, they were flawed and out of their depth, and they were also victims who loved Ben very much. I'm pretty sure there is no 'What to do when Snoke targets your child from birth' chapter in the What to Expect When you are Expecting book!! tee hee..
hiya! I can see it too! But.. I can also see how this is literally classified as a 'crazy theory' - I read an article which listed crazy theories for IX and this theory was there lol. so I"m officially crazy. haaaaa..
Yep! For all the reasons you mention BastardofMandalore - I would not discount the possibility of a Snoke return in IX, or anywhere else in SW canon. We shall see! So glad you are having fun exploring this too! I got curious about Rian's comments to do with his decision to eliminate Snoke in TLJ. Is it ruled out by what Rian has said? I'll share a few quotes I found, and if anyone has any others related to this I'd love to hear about them. thanks! -If Snoke were to return, it would be to a different situation - Kylo is no longer his apprentice, Snoke can no longer read his thoughts, and Snoke is no longer emperor (SL). snippets from his empire podcast on the last jedi with spoilers were mentioned in this article..
White, January 15, 2018\" wrote: "I like Snoke as a character as Andy (Serkis) plays him," the director clarifies. "He's delicious, evil and fun. But Kylo to me is where the interesting stuff is. And the notion of clearing the deck of the Vader/Emperor dynamic so that all bets are off in terms of how the villainy is going to play out, that to me seemed like a much more interesting thing. And it just seemed natural. If he had stopped in the middle of a scene and given a monologue, it would've stopped it dead in its tracks, and we would've cut it out in the editing room. This is not Snoke's story." -RJ can't know for sure what JJ is going to do, but judging by the background given in TFA (Hardly any), I'd guess JJ is going to see this the same way. 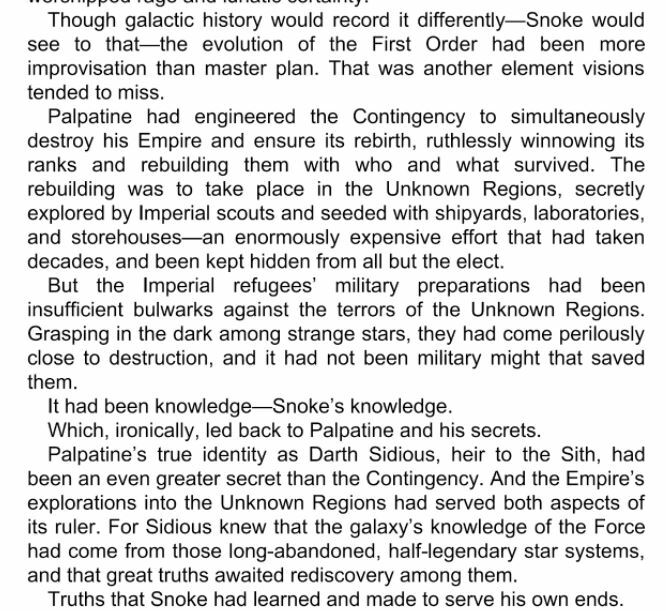 Any Snoke detailed history is going to be in books and comics. I agree with snufkin's point about this, but I don't think this rules out Snoke appearing in IX as anything more than a flashback.. If Snoke were to come back - it would need to be in a way that required little to no exposition. Snoke would just be an interesting and powerful adversary with a history/ personal grudge against Kylo/Ben and Rey.. (could be interesting I'm open to it..) it would be about what Snoke's return contributes to Rey and Kylo's story.. And a return of Snoke would mean less exposition than introducing a new big bad.. soo there is that too..
As Rian says 'all bets are off!' I'm very curious to see what they do with the baddies in IX! 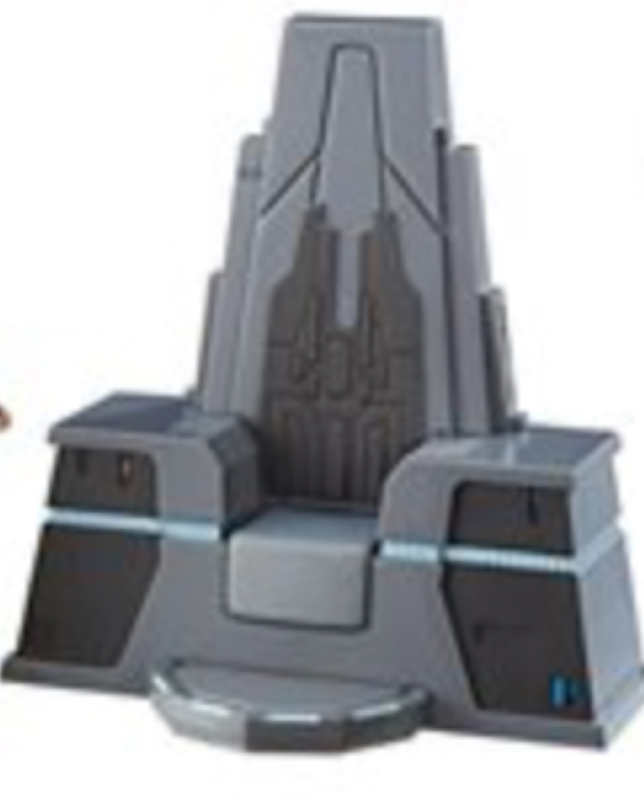 This might be nothing, but, Snoke’s throne looks strikingly similar to the Mortis temple. Could he be from the same race of beings as the Mortis gods? 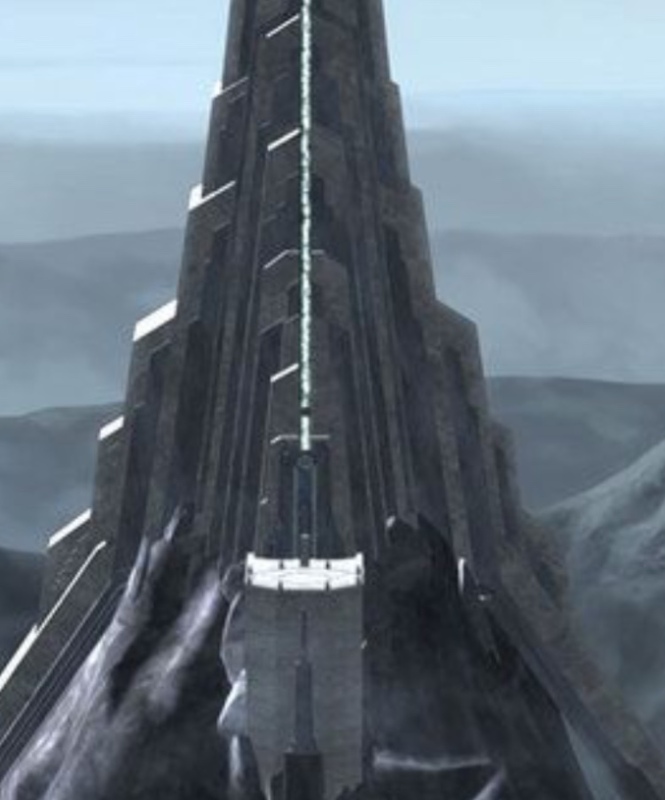 @TheBastardofMandalore wrote: This might be nothing, but, Snoke’s throne looks strikingly similar to the Mortis temple. Could he be from the same race of beings as the Mortis gods? I recall Wayward Jedi mentioning he heard/read theories that Snoke resembles the archeologist working for the Empire in Rebels (World Between Worlds), and at the end of the arc, when the temple collapses, he was caught within its destructive powers. So, if he is connected, it's borrowed/piggyback power. Interesting theory! I like the idea of Snoke possessing some poor soul’s body and using residual power from the void/in between. It just doesn’t add up though. While, I agree Snoke is tied to the Mortis/World Between Worlds mythology, I don’t think he would possess a non force sensitive vessel. He's too power hungry and arrogant. There could be a link between Snoke and Mortis, but I think it is more of a coincidence. Snoke's throne design came more likely from this concept art of Ralph McQuarrie for Return of the jedi.